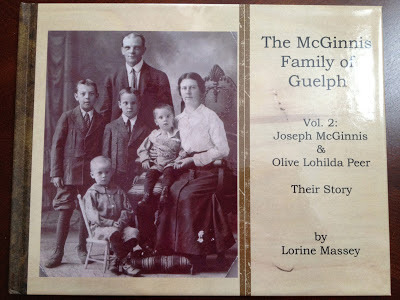 Recently Volume 2 of my McGinnis Family Story Books arrived from Shutterfly. I'm really pleased with how it turned out! Then I uploaded them to Shutterfly. I created a different size book this time. Usually I go with the 8x8 books because they are small, easy to pick up and glance through and I just like the look of them. But this time I went with the 8 1/2 x 11 and I'm really glad I chose that size. The 8 1/2 x 11 allowed me to insert a census image that was legible but had room around the edges for the page background. I could have added a border around those images or embellished the page with a "sticker" but I like the larger images to be simple and plain. You can read how I organized my book at Creating Memory Books on Shutterfly It's important to plan the layout of your book before starting. Decide on how you want to organize the pages and photos - by person? Chronologically? You can always switch pages around once you've created pages in Shutterfly but you need a plan to begin. Think about how many pages you want. I create mine to be between 20 and 25 pages. If it is going to be bigger, I break the book into separate volumes. As an example, my Story Books on my McGinnis family are in 5 volumes, one for each generation starting with my father. The smaller the book, the more manageable to create and the more likely your recipients will be to pick it up and skim through it. Anything larger than 25 pages is, for me, overwhelming to create and I believe would be too much for most people to want to glance through. Shutterfly allows me to create photo pages, or text pages or a combination of both. It's easy to quickly pick a layout for each page using their layout options. So if you want to place two photos and one text box on a page, for example, you choose from their options for 2 photos plus text. Then by using the "customize" feature found on each page you can resize and rearrange the photo and text boxes. You can add more text boxes if you want. Then you can change the background by choosing from their options for whatever theme you are using. 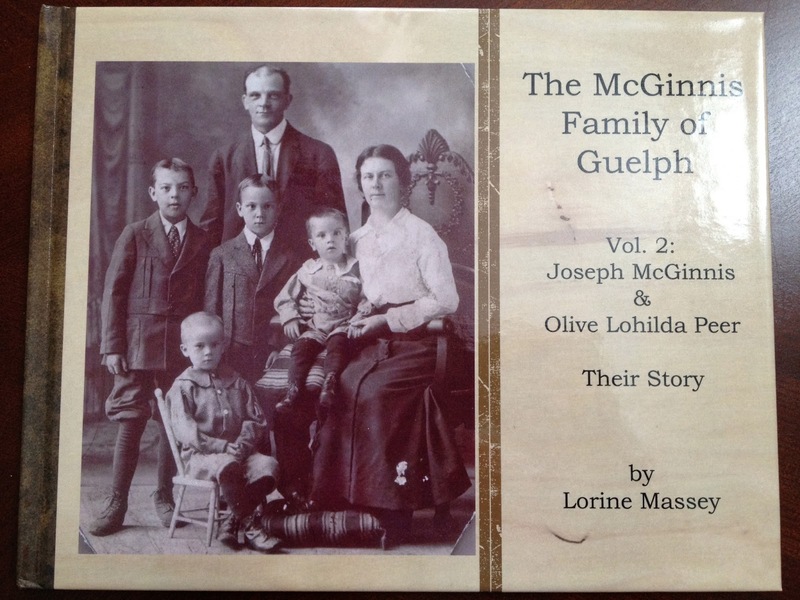 In this volume of the McGinnis family story, I added scans of newspaper clippings from a family double wedding. I am lucky enough to have the actual wedding invitation so I added that to the page along with photos of the church and of the happy couples. In the end the book is a lovely coffee table book resembling a scrapbook. But it has enough genealogical information and documents to give family members a taste of what I have found on the family. 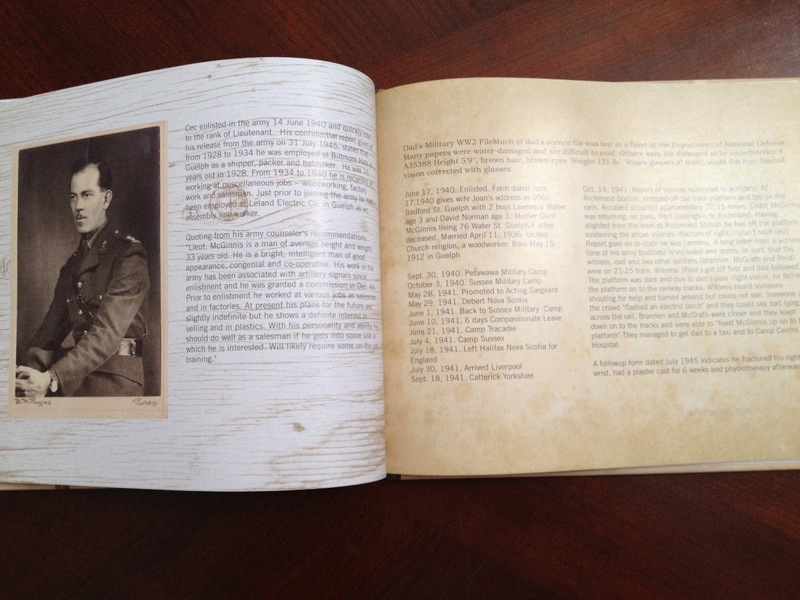 It also allows me to share the wonderful family photos, documents and newspaper clippings in my possession. You can also refer to my video tutorials on creating books in Shutterfly. 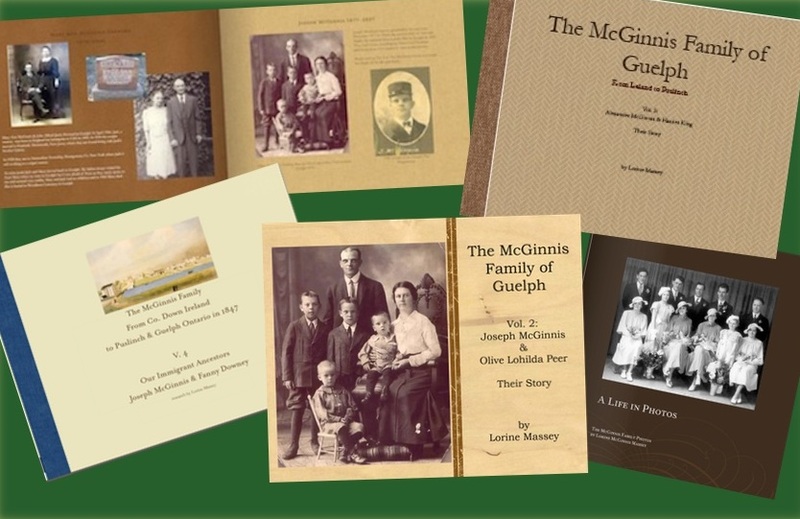 I have now created 5 volumes of my McGinnis family, one volume per generation, starting with me, then my parents with all their children, then my grandparents and their children, back to my great-grandparents who came from Ireland to Ontario Canada in 1846 during the Famine Years. I am simply in awe! Of your success in research. Of your skill in organization. Of your talent in writing. Of the quality of your projects. And of your generosity in sharing. This is beautiful and you deserve many accolades. What an inspiration. I love this article because I started to do this same thing in Shutterfly but I was having same frustration. You made it so simple - now I think I can forge ahead! Very informative post. I've pinned this, so if you start getting pinterest traffic, you'll know why. LOVE LOVE LOVE this! I too have been toying with a book but couldn't decide where to begin and end. I love your "generational" idea - simple to follow and so engaging! Thank you very much for sharing the process and the finished project - I'm inspired! I've done lots of vacation books and my daughters' wedding books on Shutterfly. 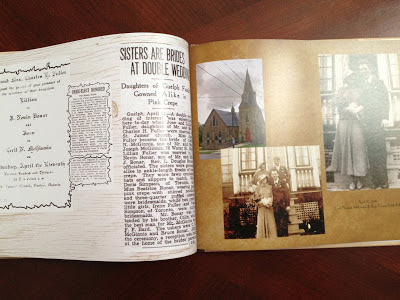 I used Blurb for my genealogy books, but I have been wondering how they would look in Shutterfly. A 25-page book is one thing, but a 100+ page book would be very expensive on Shutterfly I suspect. I like the idea of smaller volumes though so I might consider that. Thanks for showing what you did. I did a book as well (100) pages, 50,000 words and 500 pictures. I donated a copy of it to my state archives library. This can be a very expensive project. The average book seems to cost around 30 dollars. So it is not something you want to do on a large scale to sell. I spent at least 5-6 months to complete mine. Once sent in, the return time from Shutterfly was fairly quick. You must have a internet connection to send it in. They also have several nice backings like leather, and cloth. 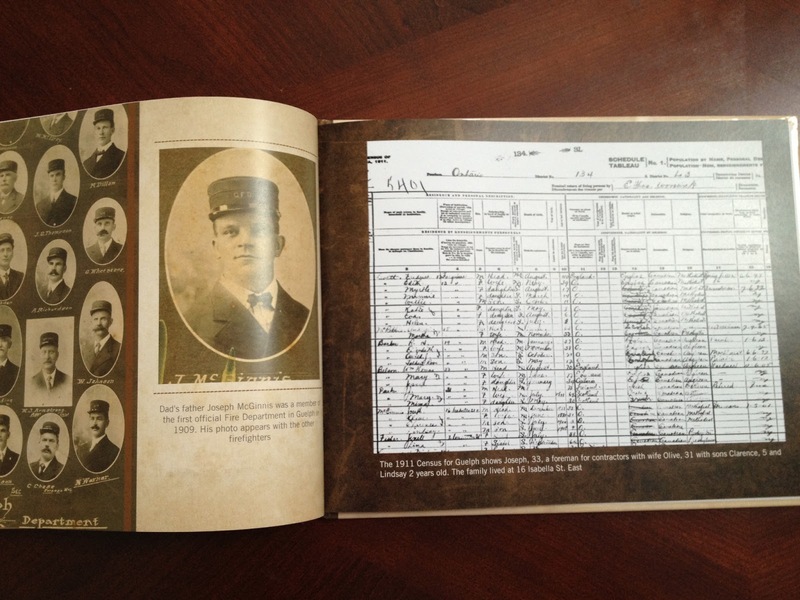 There is a process where you can put a full page picture or document behind the text. If you fade it you can put additional pictures over it. 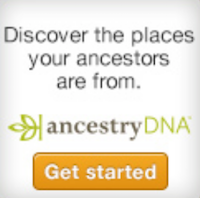 Mine would have been very expensive but I spent 35 years of research on at least 5 family lines so it was worth it when you put it in perspective. Once you get on line with Shutterfly they will begin to send you emails that offer between 25% to 75% off at certain times of the year. Mine was done around Christmas. That is their busy time and they seem to offer good discounts then through email offers on different style books, covers, paper qualities etc.. If you want a very upscale book printed to hand down through the years that seems like it will last this is the best option I have found. I am now converting it into a Word document that I can send to my nieces and nephew to read on their computer or put on regular 8 1/2 x 11 pages and make their own covers. They also seem good about any mistakes that they made by reprinting my books a no charge. ( I got to keep the bad one). It does take awhile to become familiar with all the different abilities of the program. One problem I ran into is that the format of the book is not transferable to for example a word document. You can copy and past text and pictures but can't convert the entire book or page at one time. You might want to start with a small book even if you don't print it to become familiar with it. My wife is not a computer person and she surprised me at an earlier christmas with a book of my mothers Oil paintings. She also did a limited family history of our family for my sons new bride to welcome her into the family. They were great. An attractive book. Looks like a great choice for a short book. I'll look at your tutorials. What a wonderful project! You explain it so well that I am encouraged to try this myself. Thanks very much for writing this article. Love this! Thanks again for your tips & showing some of the pages. Very helpful! Love the hints! WOuld you be willing to share the style of the pages you used? Easter Bunny's Family Tree & Bible Found! Wearing the Green on St. Patrick's Day! How Will You Mark International Women's Day? Ireland Catholic Parish Registers Free in March!